The Yum Bowl by design superstar Karim Rashid. Sleek and ceramic, it cleverly integrates a handle into it's asymmetric design. It also has a non-skid bottom and is microwave safe. He's thought of everything including beauty. Availabe at For the Dogs and discovered on PupStyle.com. The GOD - B-1 (go with DOG), a bowl and mat in one. Image reads "Puppy steps on front part of product." So your little one's paws hold it in place. 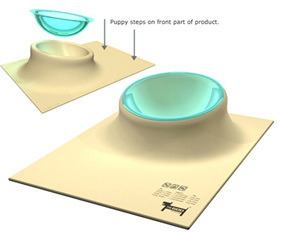 The bowl is tilted for easy access and is held securely in place while a sucker action forces the sillicone rubber mat to cling to the floor. Easy clean up too. Brilliant! Concept only right now. Designed by Seungchun Lee and spotted on cribcandy.com. 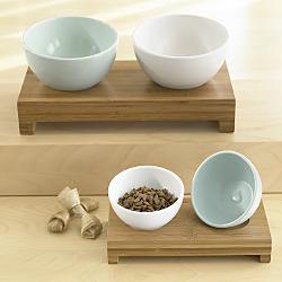 A zen variation on the bowl and mat prototype... a blue water bowl and white food bowl set into a grooved bamboo stand. From Red Envelope. 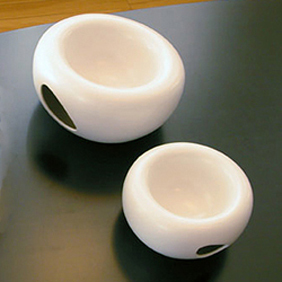 Like the Kohler faucet commercial, I would love to design a house around this bamboo dog bowl set. Gorgeous!